The article includes six parts. Cucusoft iPod Converter Suite is easy-to-use and the converting speed is fast! After testing, all formats to iPod Touch, iPod Nano and iPod Classic conversion works well, the output audio and image quality are excellent! Let’s view the steps. 1. 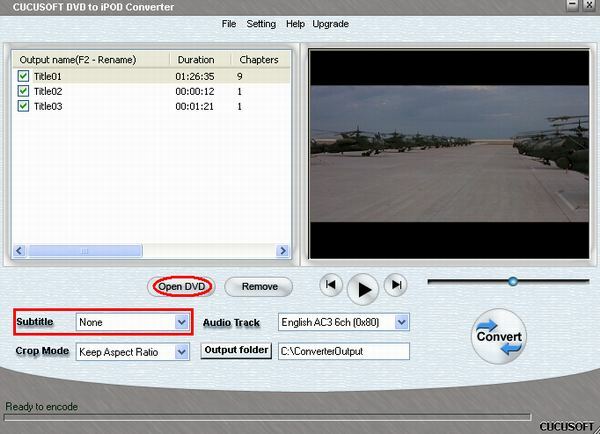 Download the latest version of DVD to iPod Converter + iPod Movie/Video Converter Suite, and install it. 2. Run the DVD to iPod Touch Converter, load your DVD by clicking ‘Open DVD’ button or choosing ‘Open DVD’ from ‘File’ drop down menu. One or several titles appear in the list after loading DVD. 3. As usual, the longest title is the main file of the movie. You can remove the title you don’t like to convert by unchecking the title. Select ‘Subtitle’, ‘Audio Languages’ to what you like. 4. To ‘Output Folder’, Enter the full pathname or choose the path where you want to save your video files by clicking the related button. 5. 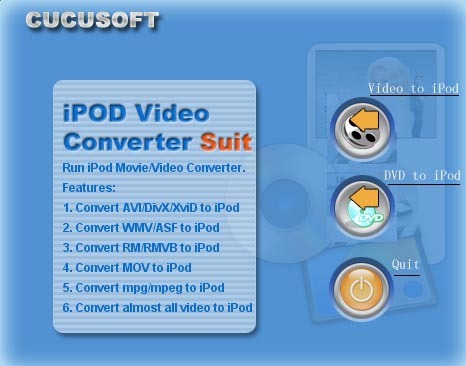 Click ‘Convert’ button to start the DVD to iPod Touch conversion. 1). Open iTunes and click “File” to add your converted videos to iTunes library. 2). plug in your iPod to computer, then iTunes will detect your iPod as a device. 3). 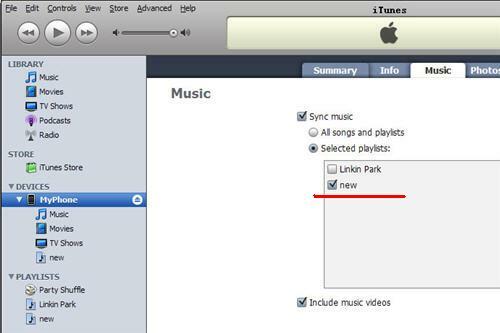 Select your iPod device on the left panel of iTunes, click “Movies” tab, check the videos you want to sync and click “Apply”, done. If you want more DVD to iPod Converters, you may take a look at this DVD to iPod Review. 1. Download the latest version of iPod Video Converter + DVD to iPod Converter Suite, and install it. 2. Run iPod Touch Video converter component. And load the video files you’d like to convert by clicking ‘Open file’ button. Click ‘Output’ and choose the pathname where you want to save your video files. Click ‘Convert’ to start converting video to iPod Touch, iPod Nano, iPod Classic MP4 or H.264 files. Tips: Before converting, you can click ‘Advance -> Video settings’ to set ‘Video format’, ‘Resolution’, ‘Framerate’, ‘Output Quality’. If you’d like to convert video to H.264 files, please set ‘Video format’ to ‘H.264 FQ Variable Bitrate’. 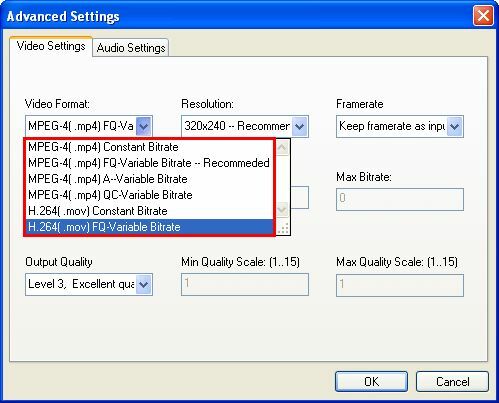 ‘MPEG4(.mp4) FQ Variable Bitrate’ is the default value. Certainly, you can also set ‘Audio Bitrate’, ‘Channels’, ‘Sample Rate’ and ‘Volume’ in ‘Audio Settings’ page. As usual, we set “Resolution” as “480*320” for iPod Touch, “320*240” for iPod Nano, iPod Classic and iPod Video, certainly you can also choose other video sizes you like. 3. After converting, you can open the output folder to check and play the iPod video files (.mp4 or .mov) using Quicktime Player (Freeware, Quicktime Player+iTunes downloading addresshttp://www.apple.com/quicktime/download/win.html ). 4. Transfer the iPod videos to iTunes by draging or clicking “File -> Add File to Library”. Now, you can enjoy them on iTunes. 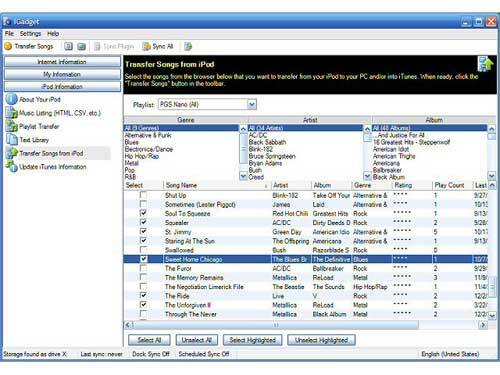 Then hit “File -> Sync iPod” to transfer the video to your iPod Touch, iPod Nano, iPod Classic and iPod Video. DVD to iPod Converter for Mac can rip protected DVD movie to iPod straight with high video quality. It supports converting an entire DVD to one iPod video file, and also supports ripping any segment by setting “start time” and “end time”. It supports all series of iPod including iPod Touch, iPod Nano, iPod Classic and iPod Video. Download the latest Mac DVD to iPod Video Converter, insert the DVD movie you’d like to rip into the DVD drive, click “DVD” button to load your DVD, select the output format and set the optional parameters, then hit ‘Convert’ to start the iPod DVD conversion process. You can know more about this software by referring to here. When you finished the DVD to iPod Touch conversion, drag the mp4 video to your iTunes library, plug in your iPod to computer, and click iTunes “File” menu -> “Sync iPod”, then your DVD movie will be transfered to iPod automatically. iPod Video Converter for Mac can not only convert AVI, WMV, MPEG, RM, RMVB, ASF, MOV, DivX, XviD, MPG to iPod Touch/Nano/Classic/Video MP4, but also extract/convert media files to iPod audio M4A, MP3 on Mac OS X. It is easy to use. 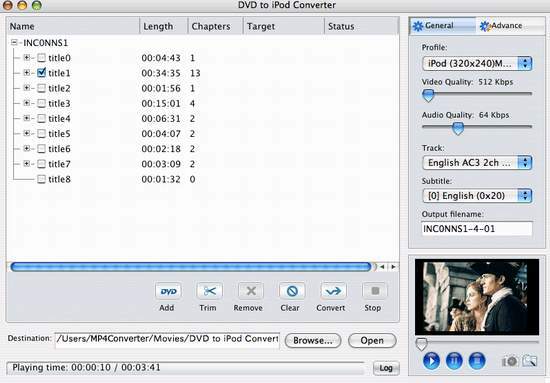 Just download and install Mac iPod Video Converter, load your video files and convert by clicking “Add” button, and then click “Encode” to start the conversion. When you finished the Video to iPod Touch conversion, drag the mp4 video to your iTunes library, plug in your iPod Touch/Nano/Classic/Video to computer, and click iTunes “File” menu -> “Sync iPod”, then your converted video will be transfered to iPod automatically. Step3. Connect your iPod to computer, open “My Computer”, open the iPod drive (the new drive with your iPod name), and copy the txt file to the “Note” folder, done. Then you can read the text file on iPod note.